Yes, we made it to Turkey and I can't even describe the joy I felt as I wrapped my arms around my daughter. It was a long 10 months...as soon as I heard her call my name, I burst into tears. And how do I ever thank her host mom for being there for Annie when I couldn't be? We've been here for one day and already I'm in love with Turkey. The scenery is beautiful and even better is the hospitality we've encountered from everyone. My husband and I just look at each other and say, "Can you believe we're in Turkey?" My friend Margaret Towery, who is teaching the Advanced Summer Institute with me published her blog today too! Margaret and I have been friends for 20 years. We met when we agreed to be co-leaders of our daughters' Daisy troop. Our girls are now 25 years old and Margaret and I are still plugging along. Her thinking spurs me forward and I've been talking to her about starting a blog for a LONG time. I think you're going to like it. Please visit her blog and leave a comment. I am so excited that one of my friends has joined the blogging world. 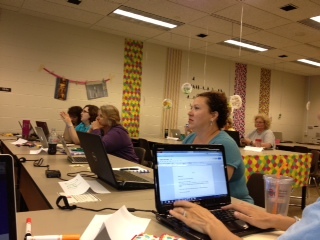 We had a great discussion at our Advanced Summer Institute today about blogging. After much thought and deciding on a name, Debbie dove in today. If you know Debbie, you will hear her voice in her post. Check out her blog and leave a comment for her! 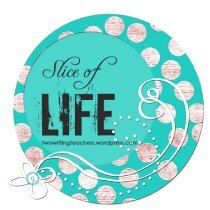 Thanks to Ruth and Stacey for hosting Slice of Life Tuesdays. You can check their blog for more Slice of Life stories. This week I am teaching an Advanced Summer Institute on Digital Writing with 2 of my favorite people and teachers, Gretchen Taylor and Margaret Towery. All of the participants in our class are past participants in the Columbus Area Writing Project Summer Institute (which if you ever have the chance to participate in a summer institute, you absolutely must!). Earlier in the school year, Margaret, Gretchen and I, along with the co-directors of CAWP met regularly with Troy Hicks to build the foundation of this class. We learned so much from Troy and experienced first hand the struggles and successes of reading and composing digitally. If you haven't read Troy's books, please check them out. Both are a wealth of information! 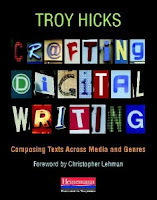 The Digital Writing Workshop was published in 2007. Crafting Digital Writing is brand new. Our class began yesterday. As is always true, when there is a gathering of National Writing Project folks, good things are going to happen. We have a dynamic group of teachers who are willing to take risks and step outside their comfort zones as we cover new territory (or in some cases, revisit old territories). Today, Gretchen led us through Twitter. I am someone who dips her toe in and then backs out and today I realized why I've been reluctant to jump right in. I am one of those people who has a need to do it all. (It's not a healthy way to be, so I don't recommend it). I was shying away from Twitter because there was no way I could take in everything offered out there. I realize how silly this is...what would I tell a colleague or a student? I'd tell them to take what they could and leave the rest. I decided to take my own advice (which is a little like taking your mother's advice) and give myself permission to take in what I can and not worry about the rest. I will not be part of every conversation out there, and that's ok. Tomorrow, I will be leading the group in learning about blogging. Most of the class is interested in starting their own blogs and some want to blog with their students. I remember how scared I was when I decided to put my voice out there. I worried that no one would care what I had to say or that I wouldn't have anything unique enough to offer my audience. Sharing our thoughts puts us in a vulnerable position and that's scary. I'd love some feedback from the SOL community. What advice would you give to new bloggers? How do you mangage your time for blogging? Where do your ideas come from? How do you keep going? How do you even decide where to start? What do you do when you don't know what to write about? I will share your thoughts with the group tomorrow. If you would please also leave your blog address in your comment, we can directly go to your blog. We'll also be building RSS feeds. Make Just One Change: Teach Students to Ask Their Own Questions by Dan Rothstein and Luz Santana. 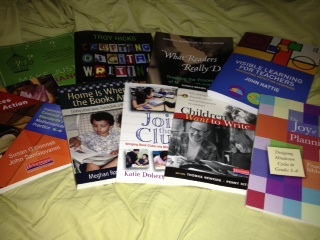 I'm looking forward to delving into all of these books. Hopefully, I won't procrastinate and run out of time to do all the reading I want to do. 1. Be neat. Don't be guilty of having a desk covered with crumbs and coffee stains. 2. Observe common table manners. You should not talk with your mouth full, or borrow someone else's spoon or cup without permission. 3. Don't let the coffee break interfere with business. The excuse for a coffee break is that it increases efficiency, but it can be harmful to business if not used with discretion. It is not polite to tell a receptionist to keep a visitor waiting in the reception room until you have a chance to finish your second breakfast. Then there is a whole section about getting coffee for your executive. I wonder if there are secretaries out there who still have to get coffee for their bosses? 1. Do not interrupt or be impatient. Listen attentively. Do not make the other party repeat because of inattention on your part. 2. Do not try to talk with a cigarette, pencil, or chewing gum in your mouth. 4. If you have to put the receiver down for any reason, put it down gently. As I skimmed through the book, I couldn't help but think about how our roles as women in the workplace have changed. 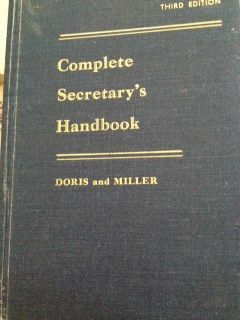 I'm sure there were very few women executives when this book was published and probably even fewer male secretaries. Add to that, the new technology we now have. Secretaries no longer need to know the ins and outs of correcting their typing done on a typewriter or how to send a telegraph. I can't help but think how differently this book would be written today in 2013. My mom's birthday is on Thursday. I think I'm going to wrap the book up for her. She was still a young girl when the book was first published in 195. I think she'll get a kick out of the book and I'm pretty sure it will bring back some memories of her early jobs as a secretary. I'll be anxious to hear her stories. 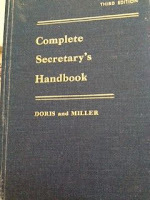 By the way, when I searched "Secretary's Handbook," I got over 1,000 results from Amazon. Thank you to Kellee and Jen at Teach Mentor Texts for hosting It's Monday! What Are You Reading? You can check out their blog for some great ideas for new reads. I'm so glad to be back into joining this wonderful group. I picked up a couple of picture books when I was at the library this week and learned something about two people I hadn't known much about. 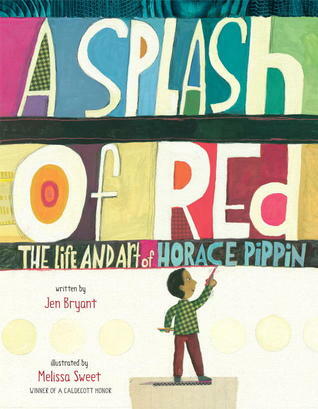 A Splash of Red by Jen Bryant and illustrated by Melissa Sweet is about Horace Pippin, an American artist who was injured in World War I, thought he would not be able to do his art again, and found a way to overcome his challenges. I always love Melissa Sweet's illustrations and this book does not disappoint. Just as interesting as the book are the endnotes and list of resources found in the back. You can find more information about Horace Pippen at http://asplashofredbook.com/. I had not heard of Anne Carroll Moore before today, nor had I ever considered that a children's space in the library had not existed at one time. 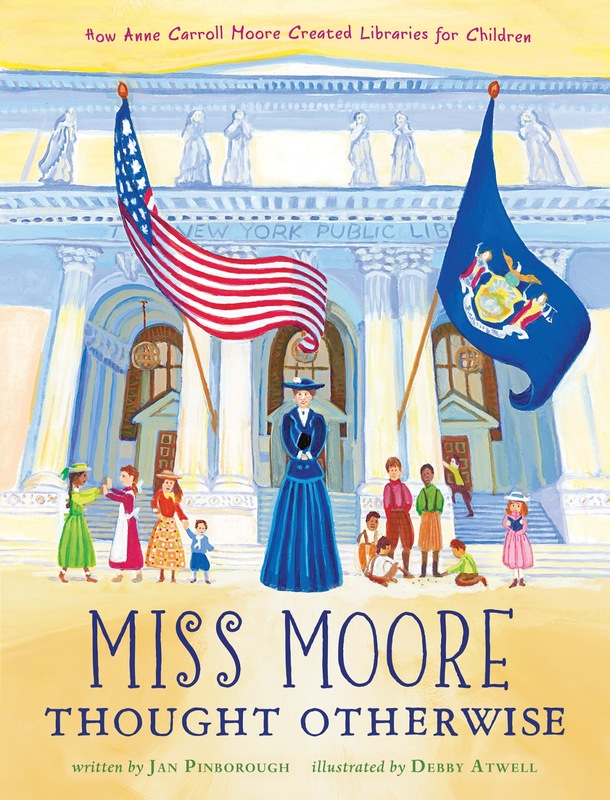 Miss Moore Thought Otherwise by Jan Pinborough and illustrated by Debby Atwell, (this phrase is repeated throughout the book) is about Anne Carroll Moore, who created the first spaces for children at public libraries. In the late 1800s and early 1900s, there were few books available for children to be borrowed. Those with the power believed that children would ruin library books, they wouldn't remember to bring them back, and reading wasn't very important for children, especially girls. (That's scary!) 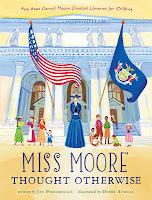 Here is more information about Miss Moore from The New Yorker.